Fake pearls can be just as beautiful as the real thing. Many people wear faux without others knowing the difference. Pearls have become a timeless symbol of class, femininity, elegance and beauty. Faux pearls can be the perfect finishing touch on just about about outfit or look. Whether causal or formal, pearls are diverse and can give you the look you desire. Even if you can’t afford real pearls that’s no reason not to keep the faux version looking just as pristine and elegant. Imitation pearls have the same luxurious look as real natural pearls. Cleaning them on a regular basis will keep them from turning colors and expand the life and use of your item. Discolored cultured pearls can feel cheap looking if they are allowed to discolor. Here are a few easy ways to make sure they stay looking the same way as the day you bought them. Examine your pearls. Make sure the top coat is not damaged. Look for areas that may be chipped or peeling. Cleaning over these parts may further damage the look of your pearls. The top coat that makes them appear smooth and satin like shouldn’t be disturbed if it is already in poor condition. Make note of any damaged spots you may find. Place some mild liquid soap and warm water in a glass bowl. You should adjust the size of the bowl according to the size of your pearls. The bigger the pearl item, the bigger the bowl should be. Make sure there is room to move the pearls around freely. Place your pearl item inside the bowl with the soapy water. 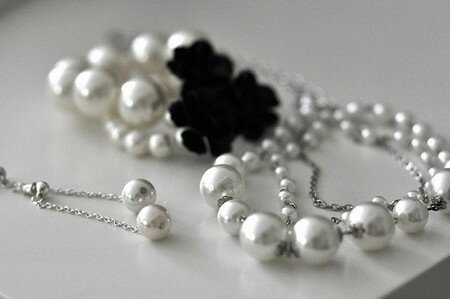 Allow the pearls to sit for several minutes to loosen up dirt, grime and oil that has collected on the item. You need to clean the pearls and threading. Find the threading between the pearls and clean them with a toothbrush. Rinse the dirt and oil off as needed. Then use the toothbrush and clean the surface of the pearls. Pay special attention to the heavier soiled spots. Clean those well. They make take a little extra time. Remove the pearls from the wild soapy water in the bowl. Lay them flat on a clean, dry paper or cloth towel. Lightly pat the pearls dry. Check the metal clasp to see if it is wet. Dry the clasp completely. If you allow water to sit too long on the clasp it may rust ruining another element of your faux pearl necklace.